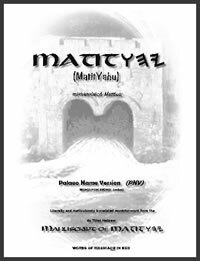 New English translation of the book of Matthew directly from the Hebrew Text of the Du Tillet manuscript discovered in Rome in 1553 confiscated by the Inquisition in a house-to-house search for Hebrew writings. Translated from the Hebrew into English by Todd Effren. Palaeo-Hebrew restored where The Name is used and Yahushua's words printed in red. 8.5" X ll", 88 pages with commentary, glossary and more.